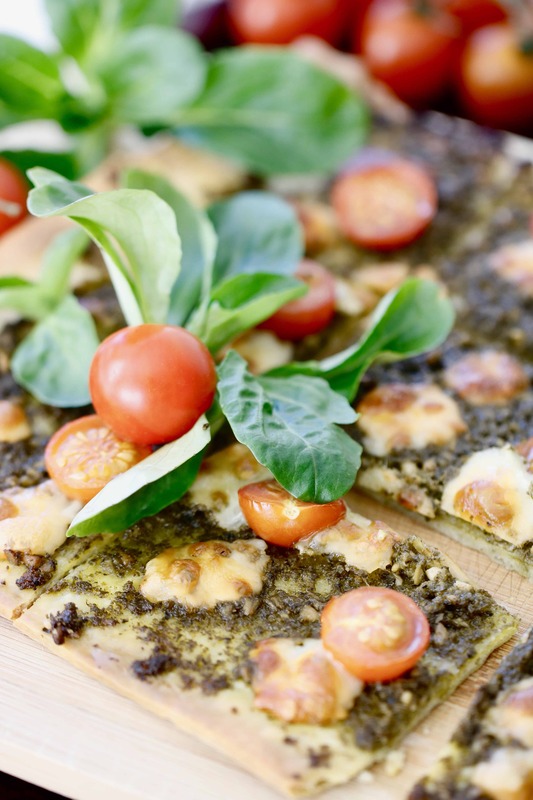 And of course the 4 Layer Mexican Pizza in the Fertility Foods Cookbook! 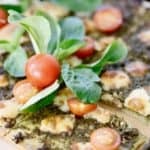 Thus, I knew this month when the ladies over at The Recipe ReDux invited us to come up with a holiday themed dish, the pizza was going to make another come back! I mean come on, I am living in the Italian part of Switzerland right now and pizza just so happens to be a regular thing on our menus! While this is certainly festive enough to be served as a holiday appetizer, it’s definitely a year round staple in our house. The beauty of this pizza is that it’s simple swapped (aka time saving!!) with a delicious store-bought whole grain crust. You can easily pick up a gluten free crust here too so you can kill two birds with one stone depending on the dietary preferences of your holiday guests. My only words of caution with this recipe are DO NOT MAKE IF YOU ARE ALONE. Now, who’s ready to dive in?! A delicious, healthy and festive appetizer or main meal to appease the pickiest of holiday eaters! Lightly dust the bottom of the pizza dough with cornmeal. Spray a pizza pan with cooking spray and spread the pizza dough on the pan. 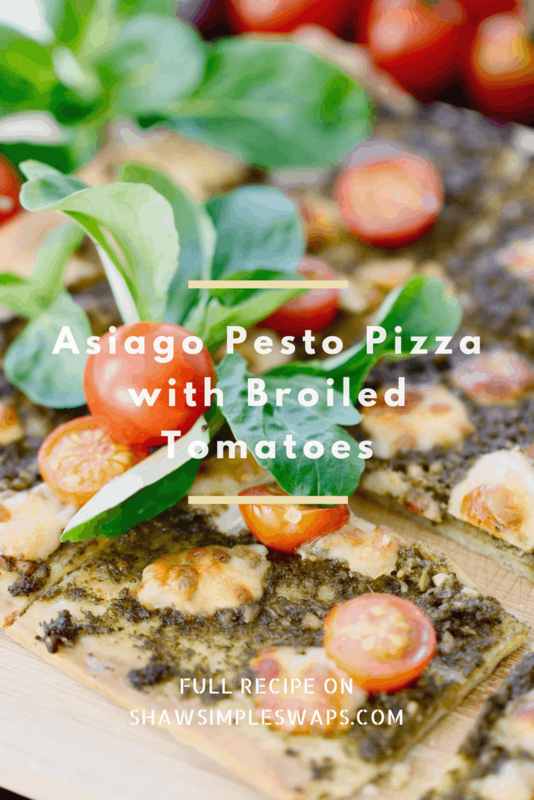 Evenly spread the pesto sauce on the dough, covering with the halved tomatoes and cheese over the top. Bake for 10 to 14 minutes, or until crust begins to brown. If you’d prefer to make your own pesto, be sure to check out my Cilantro Pistachio Pesto here! Let’s chat! What’s your favorite festive holiday dish to pass? Don’t forget to check out the amazing other recipes below, too! « Raclette, Back to the Verzasca Valley & The Most Magical Waterfall I’ve Ever Seen! 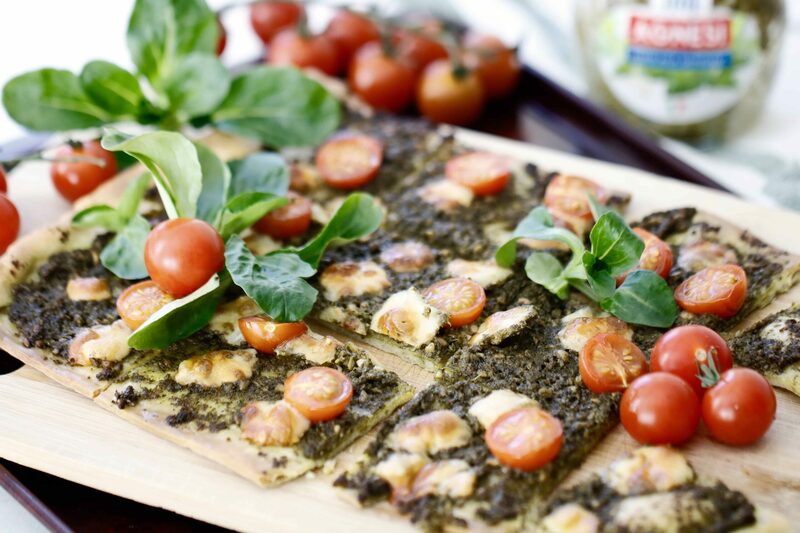 Flatbread is such a great option to share! Or not to share…. this looks too good. Lol! You need to come back home – I want to do a pot luck with you and Teresa! I want to be home!!! Soon~!! Love these classic flavors together! So much flavor packed in this pizza! Nom Nom! This was delicious! I loved how simple but yet sophisticated this dish was! Beats cheese and pepperoni any day! This was a great use of some leftover pesto I had in the fridge! Thank you! Cooking this right now–literally so simple, win for me! Fun fact, every Friday is pizza Friday in our house 🙂 We made this last night and it was delicious! !